The NPPL DC Challenge is August 6-8, 2010 and will be held at PEV’s Paintball Park. The DC Challenge will host the East vs West All Star game and announce the first inductees to the NPPL Hall of Fame. Registration for the NPPL DC Challenge is now open. 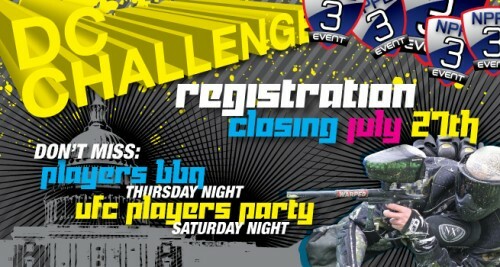 The DC Challenge will take place from August 6-8, 2010 at Pev’s Paintball Park in Aldie, VA. The DC Challenge will have an East vs West All Star game. The first ever Hall of Fame of paintball. A special ceremony will be held for the inductees. On August 5, 2010, there will be a pre-event player bbq with NPPL staff and crew.